How can serviced offices help growing businesses? Serviced offices are great for those who want a professional and productive home for their business or startup, but don’t want to be tied into a long-term contract. For those taking their first forays into the world of workspace, the terminology can sometimes be ambiguous and confusing. From co-working to shared offices, agreements to terms, leases to contracts, it can be hard to know what to look for. Serviced offices encompass private, shared and co-working spaces that have a single fee. This fee is charged on a monthly basis and covers rent and service costs. The maintenance of the building is the responsibility of the office operator: they ensure everything runs smoothly so you can prioritise your business. This option is popular with both SMEs and larger companies because spaces come in all shapes and sizes, from small private pods to entire floors in a building. 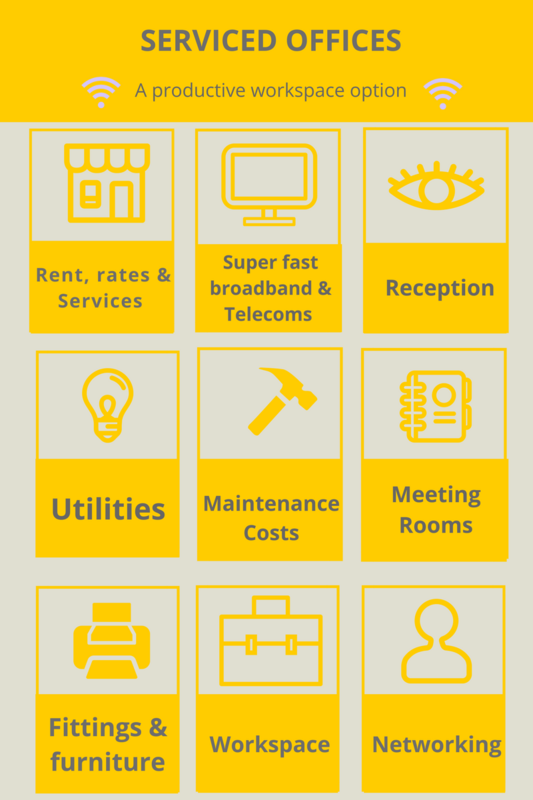 Serviced offices are successful because they are incredibly flexible – you can rent them on a monthly basis. They’re also designed in a way that promotes productivity, professionalism and, in many cases, collaboration. Understandably, people don’t want to risk committing to a lease of three to five years, particularly in an unpredictable economic climate such as ours. Serviced workspaces cater for those who want to rent space on a short term basis, whose business is growing or scaling down, and who want to focus solely on their enterprise. Hayley Williams runs Keystone Marketing, a freelance marketing agency based near Cambridge. When her business took off, she realised she needed a professional environment to invite clients to and once she had more work than she could deliver herself, she knew her workspace at home would no longer suffice. Hayley decided to rent space in a serviced office – The Workstation– in her home town of St Neots. “Making that investment 18 months ago (from a home study) has paid dividends. We were a newly formed team of two when we moved into our offices – we are now four. Through the people we met directly on the back of moving into the office, we have obtained four new clients that make up a significant proportion of our income over the last year, as well as our new bookkeeper who’s helped our move over to cloud based accounting. I actually didn’t realise how isolating and lonely I’d been working from home. Our office building is full of friendly faces and like minded professionals; we support each other and motivate each other. Flexible workspace really is a booming sector. 2016 was a record year for serviced offices; the number of centres offering this type of workspace grew by 11% to almost 3000 locations in the UK alone. With so much choice out there, how does one go about finding a workspace without having to trawl through endless listings and websites? The simplest and most time-effective solution is utilise the knowledge and expertise of an office consultancy – like Search Office Space– to find a workspace quickly. Workspace consultants use their knowledge of the marketplace and industry connections to match businesses with their ideal workspace, completely free of charge. Kate Tattersfield is a copywriter at Search Office Space, the longest running flexible workspace consultancy. SOS provide a free search and support service allowing businesses and freelancers to compare the entire flexible office market in one place.